Thank you for this refreshing look at the spine and pelvis relationship. In some of the provided photos, the depth of the twist appears to be greater when the pelvis is allowed to rotate with the spine. How do you approach/instruct exploring new depths to these poses? Thank you Jason. After years of practice I feel that twisting with the pelvis ‘fixed’ has been straining my SI joint and causing lower back instability. I’d love to hear your thoughts on updog to downdog. This transition of backbend to forward bend also seems a lot for the lumber/SI joint. I’m glad this article is helpful for you, Rachel. Thanks for reading. Great to hear from you, Anne. It’s tough to look backward on a practice and decide what would have made a difference if only you had done it. But, yeah, moving the pelvis and spine together in all postures is definitely a key step in keeping the region happy. Your article is a breath of fresh air for me. I am not a flexible person, so when I twist I need to twist my pelvis also a little bit and it makes me feel comfortable (I often do Phase 2 of the pose pictures posted above). However, my teacher totally disapproves and always tells me to always let my pelvis stay and it makes me feel a little bit uncomfortable. I will share this article on my facebook. Thanks for your point of view. Yoga should be enjoyed and make us feel comfortable. Glad this helps you, Lauwardy! Commenting on Rachel’s comment on transition from updog to dd being tough transition for lumbar/si joint…what has worked for me is to neutralize my spine before going straight to dd by coming up or pushing up on a plank with top of my toes still firmly planted on the mat from updog, thereby neturalizing my spine before going to dd. I LOVE when a teacher revisits their cues and is not afraid to say they found a better way. This teaches our students we are human and we are seekers, hopefully allowing them the power to change their minds too. Thank you for sharing such great tips on this site! 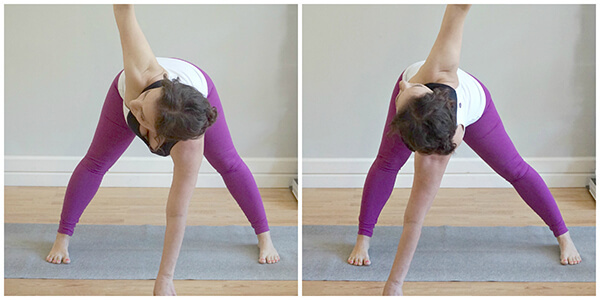 Wondering about the knees in phase 2 of parivrtta utkatasana? My knees give me pain in uttanasana or utkatasana when my knees edge too far forward; it’s much better for me to keep slightly more weight in the heels and keep knees in line with the toes. Would extending the knee outside this alignment cause instability here? Fabulous article, much appreciated insight! You’re 100% correct. For some students, flexing the knee more deeply in this pose can be problematic for the knee. If this motion is creates discomfort in your knees, you should avoid it. Feel free to keep your weight a little further back and maintain a more vertical alignment of your shins! look at the photos, the pelvis (the illium, ischium, pubis and sacrum) moves as 1 unit. in the images shown with a “stable pelvis” the woman pictured is shown keeping her pelvis stable in relation to her legs (legs stay in 1 spot, hips stay in 1 spot, spine twists alone)… in the images where the pelvis is “rotating with the spine” the pelvis is moving on the femurs (you can see this in the parivrtta prasarita padottanasana pose, the left side of the pelvis has moved anteriorly, inferiorly and rotated inwardly on the left femur while the right side of the pelvis moves superiorly, posteriorly and has rotated externally on the femur…. something simillar is also happening in revolved triangle and marichyasana, except in marichyasana the left femur has just abducted more while the right had adducted more) as the spine is twisting…. and/ or the joints of the lower legs have just moved more in one leg than the other (you can see this in the utkatasana example, the left knee is just flexing more than right, and the left ankle is dorsiflexing more than the right)…. I think this is a place a lot of yoga teachers get confused, thinking they are seeing movement at one joint (like maybe the SI Joint) when they are really seeing movement at another (the hip joint). 2. what is the real difference in the shear forces present at the SI Joint in one version vs another? It requires really good core stabilization to do so. I am currently a firm believer in NOT using anything but core strength to enter a twist. A lot of times in yoga I remember being encouraged to use the strength of my arms to drag my spine into a deeper rotation. I do not think this is a good idea (particularly because intense rotational forces can be damaging to the intervertebral disks). Here is how I teach twists now – When the legs are fixed and the spine is twisting (which is the case in all the poses Jason has pictured above), hold the legs/hips in a symmetrical shape and, WITHOUT USING YOUR ARMS, twist. then set your hands down wherever they have landed. You will end up in a shallower twist (safer and more functional) and you will have used a ton of core strength to get there (good!). When the spine is fixed and the legs are moving (for example in supine twists like windshield wiper ) all of the forces involved are less so I think the stakes are lower and the “how to” of the poses matters quite a bit less … as long as (again) your aren’t using gravity plus your own strength to wrench yourself deeper into a spinal rotation. Those are my thoughts! Although would not teach the twisting method Jason is suggesting here, I LOVE the ongoing conversation about “alignment” and biomechanics and modern postural yoga, and I think we all benefit from questioning what we have been taught. So, thanks for that Jason! Thanks for reading the article and sharing your expertise. I really appreciate it. And, honestly, I wish we were in the same room, talking, and looking at people in twists. But, alas.. this will have to do. I have some follow-up thoughts regarding your intelligent comments. 1) Yes, the pelvis works as one unit. Agreed. Except, of course, for the small–but problematic–flares and tilts that can occur in the ilium. The Coxal joint rotates. As you wrote–and I described–the pelvis moves on the femurs. I’m calling the movement of the pelvis in which you turn the pelvis in the direction that the spine is moving “rotation.” The pelvis rotates in the transverse plane. It can move clockwise and counterclockwise. In fact, when describing the movement of the pelvis in your note–which you took even further than I did and included an expert description of femoral motion–you described the pelvis as rotated. So, I’m genuinely not sure why you wrote that the “Pelvis doesn’t rotate.” It’s possible that you meant the Sacrum doesn’t rotate. But, this article doesn’t contend that the sacrum rotates. It only expresses the concern that turning the spine without turning the pelvis (even a little) may disrupt and destabilize the connective tissues of the region, promote greater laxity in the region, and produce less congruity between the sacrum and the spine. 3) Here here. I agree with your concern about asymmetrical postures with regards to SIJ issues. I’ll take this further and say that it’s not just asymmetrical postures, it’s the transitions in and out of asymmetrical poses that can be problematic for a lot of students. But, being concerned about asymmetrical postures and twists as they relate to SIJ issues aren’t mutually exclusive. In fact, I’m including a link from an article by Judith Laster, whose a Dr. of Physical Therapy and Yoga Teacher with are than 30 years experience in the field, that takes the same perspective as I do regarding the pelvis and spine in twists. http://www.yogajournal.com/article/yoga-101/anatomy-101-understanding-sacroiliac-joint/. In the article, she makes the exact same argument about initiating pelvic rotation prior to spinal rotation in twists. In fact, she made the argument LONG before I stated the case in this blog piece. And, in her experience, she believes that “twists are a top culprit behind SI joint injuries.” She too believes that allowing the pelvis and the spine minimizes SI risk. I’m never going to disagree with someone saying that they believe in less torque and more moderate movements in yoga. I’m 1,000 percent in agreement that a more “shallow” degree of rotation–and focusing on core stabilization–is a good idea. Yes, absolutely. 4) I agree. In my experience, core stabilization and pelvic rotation aren’t mutually exclusive. I think students can be taught to do both. 5) Again, this is totally reasonable. And, it’s largely what I advocate for in the first phase of twisting. Once the core is integrated, my preference, though, is to free up the motion of the pelvis and spine a little bit more than you prefer. I don’t crank away, but I do like a little more motion. Facilitating strength and stability is super important. Facilitating integrated mobility is also super important. Thanks again for your time, honesty, and well-reasoned thoughts. Your students are in good hands. 1. NOW I get what you mean when you say the “pelvis rotates”, you mean the pelvis rotates on the femurs, I was thinking you were referring to rotation at the SIJ (I have read things from other yoga teachers who think there is a lot more movement at the SIJ than there is – lots of researchers contend that there is none, those who think there is some agree that it is small enough to be unmeasurable by any tool currently available to us). Sorry, my misinterpretation of your words there! 3. I would be curious what the evidence is that twists are a “top culprit behind SIJ injuries”, is this just Judith’s anecdotal experience, she sees that people get a lot of pain in that region in twists? I don’t see any references listed with her article. I know there is great evidence to show that rotational movement in the spine is a top culprit in disc degeneration and wear and tear on the spinal ligaments, but I have never heard this put forth as a mechanism of injury or degeneration at the SIJ. There is moderately good evidence to suggest that asymmetrical movement is a culprit, and I agree with you that this definitely includes transitions in and out of asymmetrical poses (by evidence I mean randomized controlled trials or that explore joint movement and joint stress). 4. When I say “core” I am referring to the muscles of the gluteal region as well all of those of the abdominal region and the lumbar region (all of the muscles that control femoral rotation as well as a number of trunk rotators) …. I know the word “core” is not very well defined but that is what I meant by it. I actually think in a lot of ways you and Judith and I are on the same page here (we all want to find a way for students to rotate less in their spines), I’m just saying; why solve the problem by kicking the rotational stress down the kinematic chain? Why not just quit hooking our arms around the back of our thighs all the darn time? Why find ways to shimmy ourselves into shapes that encourage dysfunctionally excessive movement? What’s the point? Unless someone wants to win at a yoga competition, or be a contortionist, or impress their friends I don’t see that there is one. Thank you for engaging in this conversation! Thanks again for your follow-up, Margaret. I’m going to keep this one brief and move all the way down to your last 3 paragraphs. And, we both agree that we’re largely on the same page. With regards to “core” I have a fairly extensive guide to yoga and the core on my site. I’m certain that we think about the core in very similar ways. With regards to spinal stabilization and pelvic rotation over the femurs, again, I don’t think these are mutually exclusive. I agree that students don’t have difficulty rotating the pelvis over the femurs, but the problem–as I see it–is that this normal, natural, functional rotation is coached out of students. When we tell our students NOT to rotate the pelvis over the femurs, I think we’re asking them to do something that is less natural and less functional. My preference, then, is to encourage the natural movement AND encourage core stabilization with twists. Again, I don’t see these as mutually exclusive. With regard to arm-positioning and postural intensifications, again, my preference is to facilitate stability and mobility. I’ll never discourage someone from producing less motion and more stabilization in a posture. And, I totally respect that you and other teachers prefer a lower-range of motion with decreased application of leverage from the upper-extremities. That’s a sound preference. But, to be frank, I also like some assisted motion and the whole-body proprioceptive experience of connecting my arm to my leg in twists. Thanks again for all your thoughts and your contribution to this practice! Great article, Jason, and great talking points, Margaret. I enjoyed the whole conversation here, and found the information refreshing and illuminating. Nice to hear from you. And, thanks for your feedback. I’m happy it inspired you to create such a good video! I learned this concepts years ago from Judith Hanson Lasater and have been suggesting to students for years to explore the option of the lower spine region (Sacral area) to rotate with the spine..
I’d really like help on how to make my body more open so I can go deeper in the actual hip postures e.g. to get my bent front leg straigther in pigeon,or when it’s split dog to get that bent leg further over. Work on your hip-openers, Neil. I have a post on this site with my favorite 15 hip-opening postures. Dig in and keep digging in. I’m wondering if you could offer your thoughts on how teachers can offer adjustments better to students in seated twists when allowing some rotation of the pelvis. Do you feel it’s sometimes (or always?) injurious to help a student ground through the sitting bones in a twist because that prevents the pelvis from moving in the way you are suggesting? How do you adjust seated twists these days? Regarding the content: most interesting to note, I think, also the *qualitative* difference between pelvis-stay-there and pelvis-come-on-along. And then, in theory, how that qualitative difference could be just as present and vital in a pelvis-stay-there twist. In the second twist, aside from the mechanical change of pelvis rotating along, it seems to me and has been my direct experience, that there’s also much more likely to be present the vibe in the practitioner’s body of an integrated pelvis and spine, and the rest of the body for the matter, moving as one functional, coherent unit. This as opposed to pelvis neutral by a kind of locking down, and potentially lots of that good spinal twisting energy getting blown-fused by the “circuit breakers” of the lumbosacral neighborhood in general, and the SI joints in particular. So, perhaps, this “mechanical” change is equally as useful as a kind of “myofascial attitude” lesson. And then, again, perhaps that feeling of integration could rejoin at smaller and smaller increments of pelvic twist until we end up where we started, but with much more coherence, and mechanically much less lumbo-sacral shearing. Hey Liam. This is remarkably thoughtful. So thoughtful, in fact, my only thought to add is, “yes,” this all sounds reasonable to me. Thanks for practicing and adding your thoughts to the conversation. I recently did a workshop with you in Chicago and really appreciate this kind of continued exploration. I believe it encourages dialogue and teaching from our own experiences while discouraging dogmatic thinking of the “right way” and how things “should” be, especially since our bodies and practice change daily. I’ll definitely be sharing this post in our TT facebook groups. Thanks for your humble approach. Thank You – I sm also a teacher and know it is important yo question what has been done in the past and be open to change. I should have edited! Please delete previous comment and put in this one. Thank you. I’m a Feldenkrais teacher, and regularly encounter students who fix their pelvis while turning their spine. We’ve been discussing the integrated twist vs. the torquing twist. Not having a yoga background, I googled that and came upon your site. Haven’t read the entirety yet, but am so pleased to find this lively discussion. And I,too, have recently had the experience of learning that something that I believed true for many years was simply not accurate – and then taking that to my students as well. I guess that is what lifelong learning is about. Thank you again. Thanks for your thoughts, Linda.